The knee examination should be performed in a standardized manner. The examination starts with inspection, followed by active and passive mobilization and isometric muscle testing. Finally, palpation and specific tests should be performed. The tenderest point of the knee should be examined last to prevent a guarding reaction from the patient due to pain. The knee is composed of 4 bones: the femur, tibia, fibula and patella. All these bones are functional in the knee joint, except for the fibula. The femur is the longest and strongest bone in the human body. The proximal end forms the head of the femur, which projects anterosuperomedially to articulate with the acetabulum. The distal end is wider and forms a double condyle that articulates with the tibia and patella. The tibia articulates with the distal lateral and medial femoral condyles. The patella articulates anteriorly to the femoral condyles in the region of the intercondylar fossa (trochlear groove). The ligaments of the knee joint can be divided into the extracapsular ligaments and intra-articular ligaments. The extracapsular ligaments or external ligaments are the patellar ligament, medial collateral ligament (MCL), lateral collateral ligament (LCLs), oblique popliteal ligament, and arcuate popliteal ligament. The intra-articular ligaments are the anterior cruciate ligament (ACL), posterior cruciate ligament (PCL), and the posterior meniscofemoral ligament. See the image below. The examination room should have enough space to observe the patient in a standing position and during walking. The room temperature should be comfortable. A height-adjustable examination table on which the patient can lie down in a relaxed position should be present. A goniometer for angle measurements and tape measure for circumference measurements may be helpful. The patient should be asked to take off shoes, socks, and pants in order to get a good view of the knee and bony reference points of the pelvis. 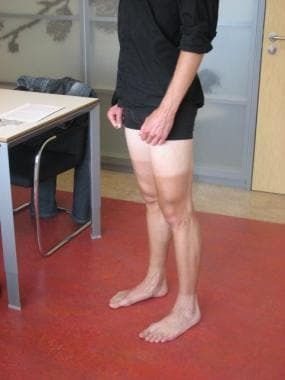 The other leg should also be visible so that differences can be observed, as shown in the image below. Patient preparation for knee examination. Before performing a thorough knee examination, the examiner should wash his or her hands for hygiene purposes and to obtain a comfortable temperature. Physical examination starts with inspection, followed by active and passive mobilization and isometric muscle testing. Finally, palpation and specific tests should be performed. Neurovascular examination is also recommended. Ligaments in and around the knee keep it in a stable position. The medial collateral ligament (MCL) provides medial stability. It runs from the medial femoral epicondyle to the tibia where it fans out on the medial side. The lateral collateral ligament (LCL) provides lateral stability and runs from the lateral femoral epicondyl to the fibular head. The anterior cruciate ligament (ACL) prevents anterior displacement of the tibia with respect to the femur and the posterior cruciate ligament (PCL) prevents posterior displacement of the tibia with respect to the femur. The cruciate ligaments are also important for internal rotation stability of the knee. The posterolateral corner (PLC) is a complex stabilization unit on the posterolateral side of the knee and prevents dorsal displacement of the lateral tibial plateau (ie, exorotation of the tibia with respect to the femur, lateral instability, and hyperextension). Stability testing is based on trying to mobilize the tibia with respect to the femur in the direction that is limited when the tested ligament is intact. When ligament rupture is present, larger excursions are seen. Comparison with the contralateral knee is always mandatory. Inspection is performed to assess shape and interdependence of anatomic structures. Inspection starts from the front side with the patient in a standing position, as shown in the image below. Inspection of the patient in standing position (front side). The load axis of the leg is checked. Usually it is neutral, meaning that the leg is straight. If an O configuration is seen, a varus load axis is present. In an X configuration is seen, a valgus load axis is present. Leg length and position of the pelvis should be assessed. 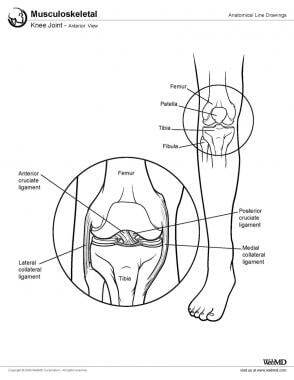 Position of the patella can be checked and provides information on rotational disorders of the leg. Inspection from the lateral side can show a flexion deformity when the knee cannot be fully extended or a recurvatum deformity when the knee can be hyperextended beyond neutral position. Inspection of the patient in standing position (lateral side). A gait assessment should be performed while the patient walks. Step and stride length, symmetry, and limb loading (left versus right) should be noted. Also, flexion and extension of the knee are watched, as well as mediolateral stability. When a varus thrust is observed during stance phase, an increased varus deformity is present. The knee is observed, with special attention to scar tissue, lacerations, and hematoma due to trauma or previous operations. Swelling is also checked. Swelling can be in the soft tissues or due to effusion. It can be intraarticular or extraarticular. Intraarticular effusion can be seen as a swelling in the region proximal of the patella. The normal aspect of the distal quadriceps is not visible anymore. Extraarticular swelling is more locally present. Swelling in the anterior of the patella is often due to a prepatellar bursitis. 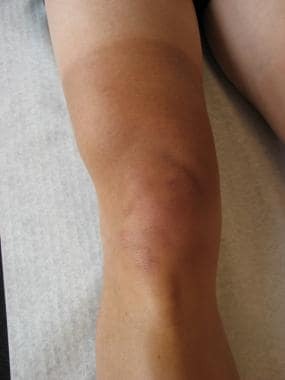 The color of the knee is checked and compared to the other side. When redness is present, infectious problems should be kept in mind. Muscle atrophy of the quadriceps and abnormalities of the patellar ligament or Hoffa’s fat tissue can also be observed. See the image below. Inspection with the patient in dorsal decubitus position. Active mobilization assesses range of motion, smoothness of motion, pain at movement, occurrence of crepitus, and lateralization of the patella. The patient is asked to fully extend and flex the knee, as shown in the images below. Extending the knee in active mobilization. Flexing the knee in active mobilization. Attention should be paid to muscle weakness and joint flexibility. Normal range of motion varies, but a range from full extension to a flexion of 140 degrees is normally possible. Comparison with the contralateral side is advised. When the knee cannot be fully extended, an extension deficit or a flexion contracture is present. When the knee can extend beyond full extension, hyperextension is present. Rotation in the knee is checked with the knee flexed to exclude hip rotations. Exorotation is approximately 40 degrees and endorotation is approximately 30 degrees. Again, comparison with the contralateral side is advised. See the images below. Checking rotation of the knee in active mobilization. Passive mobilization assesses range of motion, smoothness of motion, pain at movement, occurrence of crepitus, and lateralization of the patella. The examiner should mobilize the leg and again check the function. See the images below. Flexing the knee in passive mobilization. Extending the knee in passive mobilization. The endpoints of movement should be evaluated. They can be fixed or resilient and may be painful or not. During movement of the knee, crepitus or patellar clunking can be palpated. When an extension deficit is noticed during active mobilization and full extension is possible during passive mobilization, an extension lag is present. Passive flexion usually exceeds active flexion of the knee and can be up to 160 degrees. Passive range of rotation of the knee is larger than active range of rotation. See the images below. Checking rotation of the knee in passive mobilization. Hip rotation also should be checked because some hip problems express themselves as knee pain. See the images below. Checking rotation of the hip in passive mobilization. Isometric muscle testing assesses tonus of muscles and reveals punctum maximum of pain, differentiates muscle hernia and lipoma, and diagnoses avulsion or muscle rupture. The purpose is to assess pain, not muscle strength. The patient should sit on the examination table with the lower legs hanging down and the knee in 90 degrees flexion. The patient is asked to extend and flex the knee while the examiner holds the knee in a steady position. Patients are asked to tighten the muscle groups, not to exert maximal flexion and extension power. Muscles can be palpated to search for punctum maximum of the pain. See the images below. Examiner holds the knee in a steady position for isometric muscle testing. The patient tightens muscle groups in isometric muscle testing. Gastrocnemius: flexion of the knee, plantar flexion of the foot. Palpation is performed to determine the punctum maximum of pain, assess muscle tone, and qualify swelling. Normal anatomic landmarks such as the patella, the epicondyles, the joint lines, the tibial plateau, tibial tuberosity, Gerdy’s tubercle, and proximal fibula can be palpated and tenderness of anatomic structures should be assessed. Soft tissues like the quadriceps muscle, anserine bursa, Hoffa’s fat pad, iliotibial tract, patellar ligament and lateral and medial collateral ligaments can be assessed by palpation. During palpation an evaluation of the temperature can be made with comparison of the other side as needed. Swelling, seen during inspection, must be palpated and an assessment of its consistency should be made, as well as possible attachments to bone, subcutaneous layers, or skin. Intraarticular effusion fluctuates and can be pushed from lateral to medial and back under the patella. A Baker cyst can be palpated in the popliteal fossa. It is often associated with an intraarticular problem and is in itself benign. It should, however, be differentiated from a popliteal artery aneurysm. Neurovascular examination is performed to briefly check neurovascular status of the limb. Skin temperature of the feet, capillary refill, peripheral pulses of dorsal pedal artery, and tibialis posterior artery give a raw impression of the vascular status of the lower legs. This is especially important after high-energy trauma to the knee with resultant dislocation of the joint. Distal upper leg circumference can be measured and compared to the other side. Measurements are done 15 cm proximal to the joint line. Muscle atrophy can be the result of neurological diseases or disuse for any reason. Patients with a meniscal lesion present with pain and an intraarticular effusion due to irritation by the frequently subluxating meniscus. Meniscal testing is based on trying to subluxate the torn meniscus by applying compression and rotation forces on the knee and palpating the snap when it jumps back to the normal position. Palpation of the anterior or posterior joint line is tender when a meniscal tear is present. When the tenderness extends more to proximal or distal, the collateral ligament can be the cause of pain instead of the meniscus. See the images below. Palpation for joint line tenderness. A resilient extension deficit is present when a part of the torn meniscus luxates and mechanically blocks further range of motion. The knee cannot be extended and the stop is resilient. This clinical sign is most often associated with a bucket handle rupture of one of the menisci. See the image below. Testing for resilient extension deficit. During hyperflexion, the posterior part of the meniscus is subject to severe load forces. The patient is asked to squat or a passive hyperflexion of the knee is performed. When these maneuvers are painful, a posterior horn lesion of the meniscus is likely to be present. See the images below. Passive hyperflexion of the knee. Patient in a squatting position for a hyperflexion test. For the McMurray test, the patient is in dorsal decubitus position and is asked to relax. The medial meniscus is tested by passive flexion, valgus stress, and external rotation of the lower leg. During slow extension of the knee while maintaining the valgus stress and external rotation, a snap on the medial joint line may be palpated; this indicates a positive test for a medial meniscal tear. See the image below. McMurray test: The medial meniscus is tested by passive flexion, valgus stress, and external rotation of the lower leg. The lateral meniscus is tested by passive flexion, varus stress, and internal rotation of the lower leg. During slow extension of the knee while maintaining varus stress and internal rotation, a snap on the lateral joint line may be palpated; this indicates a positive test for a lateral meniscal tear. See the image below. McMurray test: The lateral meniscus is tested by passive flexion, varus stress, and internal rotation of the lower leg. The sensitivity of the McMurray maneuver is limited because it is incapable of trapping most anterior and anterolateral tears. The sensitivity ranges from 51% to 53%, but the specificity varies widely, ranging from 59% to 97%. [4, 5, 6] Therefore, a negative test does not exclude a meniscal tear. The patient lies in prone position and asked to relax. The knee is passively flexed 90 degrees. While giving compression from the heel, rotational forces are applied to the knee. See the image below. Apply test: The knee is passively flexed 90 degrees and rotational forces are applied to the knee while giving compression from the heel. Thessaly test to simulate the loading forces placed upon the knee. On inspection, laceration, ecchymosis, or localized swelling can be seen over the MCL. The MCL and its insertion points are tender or swollen on palpation when injured. A large effusion is usually not present in an isolated MCL injury but rather suggests cruciate ligament rupture or a meniscal rupture in the vascularized portion. For the valgus stress test, the patient is in supine position and is asked to relax. In extension, the posterior capsule and cruciate ligaments act as secondary restraints for valgus stress. To eliminate this, the knee is held in 30 degrees of flexion. With one hand on the lateral side of the knee and one hand on the ankle, an abduction force is gently applied, as shown in the image below. Valgus stress test for medial instability. On inspection, laceration, ecchymosis, or localized swelling can be seen over the LCL. The intact LCL can be palpated as a taut band from the lateral femoral epicondyl to the fibular head. This can be best performed with the ipsilateral heel placed on the contralateral knee while the knee flexed and the hip is flexed and exorotated. See the image below. Palpating the lateral collateral ligament in lateral instability testing. A varus thrust is present when an increased varus deformity is present during stance phase. Peroneal nerve dysfunction should be assessed. For the varus stress test, the patient is in supine position and asked to relax. In extension, the posterior capsule and cruciate ligaments act as secondary restraints for varus stress. To eliminate this, the knee is held in 30 degrees of flexion. With one hand on the medial side of the knee and one hand on the ankle, an adduction force is gently applied. See the image below. Varus stress test for lateral instability. In the acute injury, hemarthrosis is mostly present. This may limit knee flexion, whereas torn fibers of the ACL can mechanically prevent full extension. For the Lachman test, the patient is in the supine position. The knee is passively held in 30 degrees of flexion and the patient is asked to relax. With one hand, the distal femur is stabilized and with the other hand a gentle anterior force to the proximal tibia is applied. Comparison with the contralateral knee is mandatory. See the image below. Lachman test for anterior instability. For the anterior drawer test, the patient is in a supine position. The hip is flexed 45 degrees, the knee is passively held in 90 degrees of flexion with the tibia in neutral rotation, and the patient is asked to relax. The examiner stabilizes the lower extremity by gently sitting on the foot. The hamstrings are checked for slackness and a gentle anterior force to the proximal tibia is applied. See the image below. Anterior drawer test for anterior instability. Posterior laxity that is reduced by the anteriorly applied force can mimic anterior laxity. Posterior drawer test and the gravity sign or tibial step of sign should be assessed to differentiate. Comparison with the contralateral knee is mandatory. The sensitivity and specificity of the anterior drawer test for anterior cruciate ruptures ranges broadly, from 9–93% and 23–100%, respectively, with means of 62% and 67%. Another review found mean estimates of sensitivity and specificity of 48% and 87%. These percentages were found when orthopedic surgeons performed the physical examination. The pivot shift test evaluates the anterolateral rotational laxity that is present in the ACL-deficient knee. The patient is in the supine position and asked to relax. One hand holds the ankle and the other one the lateral side of the lower leg just below the knee. The knee is held in flexion. A gentle valgus stress and internal rotational stress is applied to the knee. The knee is now slowly extended. See the images below. Pivot shift test for anterior instability. An anterior sliding or jerking of the lateral tibia plateau indicates the test is positive. This anterior translation is caused by the fact that the iliotibial band, which creates a posteriorly directed force on the tibial plateau in flexion and an anteriorly directed force in extension, subluxates the tibial plateau anteriorly in the ACL-deficient knee when it passes the center of rotation. In the knee with an intact ACL, this anterior subluxation is prevented by the ACL. Comparison with the contralateral knee is mandatory. In the acute injury, hemarthrosis is mostly present. This may limit knee function. For the posterior drawer test, the patient is in the supine position. The hip is flexed 45 degrees and the knee is passively held in 90 degrees of flexion with the tibia in neutral rotation. The patient is asked to relax. The examiner stabilizes the lower extremity by gently sitting on the foot. A gentle posterior force to the proximal tibia is applied. See the images below. Posterior drawer test for posterior instability. When no posterior translation is present and a firm stop can be felt, the PCL is intact. When the tibia moves posterior with respect to the femur, the test is positive and a PCL deficiency present. In this test, the patient is in the supine position and asked to relax. Both hips and knees are held passively in 90 degrees of flexion. Due to the gravitational force, the tibia in the PCL-deficient knee will subluxate posteriorly with respect to the femur. The tibial tuberosity will be less prominent. Comparison with the contralateral knee is mandatory. See the image below. Gravity sign test for posterior instability. Depending on the position of the knee, isometric quadriceps contraction provides an anterior tibial shear force, no tibial shear force, or a posterior shear force. The position of the knee in which no tibial shear forces are present is called the quadriceps neutral angle. This angle is determined in the contralateral knee. In this test, the injured knee is put in the same angle and the patient is asked to contract the quadriceps. In a PCL-deficient knee, the tibia is at this moment in a more posterior position and thus an anterior tibial shear force will be present during contraction of the quadriceps. Thus the knee will be reduced to normal, which can be observed as an anterior translation. On inspection, laceration, ecchymosis, or localized swelling can be seen over the LCL, PLC, or anteromedial because a blow at anteromedial can cause PLC deficiency due to hyperextension. Effusion or range-of-motion impairment is usually not present. The intact LCL can be palpated as a taut band from the lateral femoral epicondyl to the fibular head. This can be best performed with the ipsilateral heel placed on the contralateral knee while the knee flexed and the hip is flexed and exorotated. The patient is in the supine position. The knee is passively held in 30 degrees of flexion with the tibia in neutral rotation. The patient is asked to relax and both knees are exorotated, as shown in the image below. Dial test for posterolateral corner instability. The test is positive when exorotation is greater than 10 degrees when compared with the contralateral side. When the test is positive it is repeated with the knee in 90 degrees of flexion. An increased exorotation when compared to the test with the knee in 30 degrees of flexion indicates an associated PCL deficiency. The patient is in the prone position and asked to relax. The knee is flexed 30 degrees and the angle between the axis of the foot and thigh is compared to the contralateral side, as shown in the image below. External rotation thigh foot angle test for posterolateral corner instability. The test is positive when exorotation is greater than 10 degrees when compared with the contralateral side. When the test is positive, it is repeated with the knee in 90 degrees of flexion. An increased exorotation when compared to the test with the knee in 30 degrees of flexion indicates an associated PCL deficiency. The patient is in a supine position with the knee in extension. The patient is asked to relax and the leg is passively raised by taking the great toe, as shown in the image below. External rotation recurvatum test for posterolateral corner instability. Lateral hyperextension, varus angulation, and tibial exorotation indicate PLC deficiency. The patient is in the supine position and asked to relax. In extension, the posterior capsule and cruciate ligaments act as secondary restraints for varus stress. To eliminate this, the knee is held in 30 degrees of flexion. With one hand on the medial side of the knee and one hand on the ankle, an adduction force is gently applied. See the image below. Varus stress test for posterolateral corner instability. A varus thrust is present when an increased varus deformity is present during stance phase. The patient is in supine position and asked to relax. The hip is flexed 45 degrees and the knee 80 degrees. The tibia is externally rotated 15 degrees. In this position, a gentle posterior force to the proximal tibia is applied. See the images below. Posterolateral drawer test for posterolateral corner instability. In the PLC-deficient knee, the lateral tibial plateau rotates externally with respect to the femur and no firm stop is present. Comparison with the contralateral knee is mandatory. The patient is in the supine position and asked to relax. The knee is flexed 90 degrees. One hand is at the ankle and the other one at the lateral aspect of the lower leg just below the knee. A valgus force and an external rotational force are applied to the knee. See the images below. Reversed pivot shift test for posterolateral corner instability. In the PLC-deficient knee, the lateral tibial plateau is subluxated posteriorly by this maneuver. The knee is now slowly extended. An anterior jerking of the lateral tibia plateau is caused by reduction to neutral position of the lateral tibial plateau and indicates the test is positive. The patella increases the leverage of the extension unit of the knee. Due to the direction of forces produced by the quadriceps muscle and patellar tendon, the patella tends to luxate laterally. Normally, it remains in position due to the bony form of the femoral trochlea and the medial retinaculum. When these are insufficient or the forces in lateral direction are increased, a patellar luxation is possible. When the patella is not seen or palpated at its normal position in the femoral trochlea but more lateral, a luxation is present. It spontaneously reduces when the leg is passively extended. Intraarticular effusion is often present due to laceration of the medial retinaculum. The medial side of the patella is often tender also due to this laceration, but the lateral part of the patella can also be tender due to trauma of the bony lateral restraints. The Q angle is defined as the angle between the line from the spina iliaca anterior superior to the center of the patella and the patellar tendon in the frontal plane. See the image below. Assessing the Q angle for patellar instability. A normal Q angle is between 10 and 15 degrees. In flexion, the Q angle normally decreases due to the internal rotation of the tibia with respect to the femur during flexion. Increased valgus load axis, increased femoral anteversion, or lateral position of the tibial tuberosity increases the Q angle and with it the forces in lateral direction on the patella. The patient is in the supine position and asked to relax. The knee is flexed 20 degrees and a gentle force in lateral direction is applied to the medial side of the patella. See the image below. Patellar subluxation test for patellar instability. The patella increases the leverage of the extension unit of the knee. Due to the direction of forces produced by the quadriceps muscle and patellar tendon, the patella tends to luxate laterally. Normally it remains in position due to the bony form of the femoral trochlea and the medial retinaculum. This can create a local overload of the cartilage of the patellofemoral joint, which can be painful. Patellofemoral pain is not associated with intraarticular effusion. Quadriceps muscle atrophy is usually present. Palpation of the cartilage on the medial or lateral side of the patella can be very painful. Quadriceps atrophy is often present. The Q angle is defined as the angle between the line from the spina iliaca anterior superior to the center of the patella and the patellar tendon in the frontal plane, as shown in the image below. Assessing the Q angle in patellofemoral joint testing. A normal Q angle is between 10 and 15 degrees. In flexion, the Q angle normally decreases due to the internal rotation of the tibia with respect to the femur during flexion. Increased valgus load axis, increased femoral anteversion, or lateral position of tibial tuberosity increases the Q angle and with it the forces in lateral direction on the patella. The patient is in the supine position and asked to relax. The knee is in extension. The patella is palpated on the proximal side and held in position while the patient is asked to contract the quadriceps. See the image below. The test is positive when this quadriceps contraction is painful. Devitt BM, Whelan DB. Physical examination and imaging of the lateral collateral ligament and posterolateral corner of the knee. Sports Med Arthrosc. 2015 Mar. 23 (1):10-6. [Medline]. Covey CJ, Hawks MK. Nontraumatic knee pain: a diagnostic & treatment guide. J Fam Pract. 2014 Dec. 63 (12):720-8. [Medline]. Smith BE, Thacker D, Crewesmith A, Hall M. Special tests for assessing meniscal tears within the knee: a systematic review and meta-analysis. Evid Based Med. 2015 Jun. 20 (3):88-97. [Medline]. Ockert B, Haasters F, Polzer H, Grote S, Kessler MA, Mutschler W, et al. [value of the clinical examination in suspected meniscal injuries. A meta-analysis]. Unfallchirurg. 113:293-299. Jackson JL, O'Malley PG, Kroenke K. Evaluation of acute knee pain in primary care. Ann Intern Med. 2003. 139:575-588. Solomon DH, Simel DL, Bates DW, Katz JN, Schaffer JL. The rational clinical examination. Does this patient have a torn meniscus or ligament of the knee? Value of the physical examination. Jama. 2001. 286:1610-1620. Harrison BK, Abell BE, Gibson TW. The thessaly test for detection of meniscal tears: Validation of a new physical examination technique for primary care medicine. Clin J Sport Med. 2009. 19:9-12. Karachalios T, Hantes M, Zibis AH, Zachos V, Karantanas AH, Malizos KN. Diagnostic accuracy of a new clinical test (the thessaly test) for early detection of meniscal tears. J Bone Joint Surg Am. 2005. 87:955-962. Konan S, Rayan F, Haddad FS. Do physical diagnostic tests accurately detect meniscal tears?. Knee Surg Sports Traumatol Arthrosc. 2009. 17:806-811. Harilainen A. Evaluation of knee instability in acute ligamentous injuries. Ann Chir Gynaecol. 1987. 76:269-273. Garvin GJ, Munk PL, Vellet AD. Tears of the medial collateral ligament: Magnetic resonance imaging findings and associated injuries. Can Assoc Radiol J. 1993. 44:199-204. Liu SH, Osti L, Henry M, Bocchi L. The diagnosis of acute complete tears of the anterior cruciate ligament. Comparison of mri, arthrometry and clinical examination. J Bone Joint Surg Br. 1995. 77:586-588. Rubinstein RA, Jr., Shelbourne KD, McCarroll JR, VanMeter CD, Rettig AC. The accuracy of the clinical examination in the setting of posterior cruciate ligament injuries. Am J Sports Med. 1994. 22:550-557. Moore HA, Larson RL. Posterior cruciate ligament injuries. Results of early surgical repair. Am J Sports Med. 1980. 8:68-78. Daniel DM, Stone ML, Barnett P, Sachs R. Use of the quadriceps active test to diagnose posterior cruciate-ligament disruption and measure posterior laxity of the knee. J Bone Joint Surg Am. 1988. 70:386-391. Sallay PI, Poggi J, Speer KP, Garrett WE. Acute dislocation of the patella. A correlative pathoanatomic study. Am J Sports Med. 1996. 24:52-60. The authors thank Mr. M.G.M. Schotanus for assistance with the photographs and Mr. W. Gronheid for his willingness to act as surrogate.